This month, in recognition of National Police Week, Captain Ken Roske is featured. Captain Roske is an experienced law enforcement professional with a diverse background in supervision and leadership. He is a graduate of Union Institute & University with a Master of Science in Organizational Leadership and a Bachelor of Science in Criminal Justice Management. His son has followed his father into law enforcement and is a CJM student at Union. A. Recently I guided my agency through an in-depth review of policies and practices to meet accreditation standards. This required assigning tasks to my team and delegating assignments with short deadlines. By staying focused on the goal and leading the process we were able to achieve agency accreditation in a short time frame. A. I don’t know if I have one that I admire most. Ronald Reagan comes to mind. I appreciated his ability to move into the political arena with no real political experience. He was known as the great communicator which, if we think of it, is key to being a successful leader. A. WOW — what a question; I think achieving promotions and ranking high on promotional tests shows your commitment. However, actually knowing that you can lead people during a challenge or crisis is another matter. For me, that came during the tragic fatal shooting of an officer and having to lead a team who just watched another law enforcement officer die in the line of duty. At that point I knew I could probably lead through any crisis. Captain Roske is an experienced law enforcement professional with 31 years in the profession. 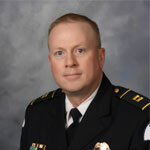 He has held positions ranging from police officer to sergeant and is currently a member of the senior management team. He is a strong believer in professional development and has striven to develop employees to attain the highest levels of personal performance and served as a mentor and coach to fellow officers. Captain Roske is a volunteer with the National Memorial Committee and a past state president of the Fraternal Order of Police. He is a graduate of Union Institute & University with a Master of Science in Organizational Leadership and a Bachelor of Science in Criminal Justice Management.